As of today, SEO is still really relevant. It’s just that a lot of people have started to move away from it, especially those who have poured all this money into it and want a pretty quick return, which makes sense. Comparatively, when you put money into paid advertising, you’re going to get returns faster versus SEO. With venture capitalists, typically they want things to go, go, go, but if you’re building a business for the long-term, you can really operate at your own pace and using SEO is a good way to go about building a brand. 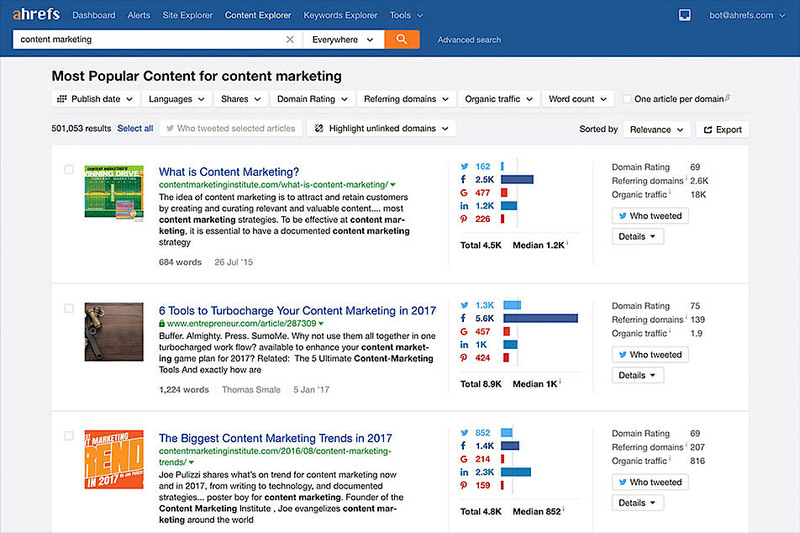 When you combine SEO with content marketing you’ll eventually get a lot of traffic, maybe a couple million visits a month, and then your SEO becomes conversion rate optimization. My favorite SEO tool is called Ahrefs. If you listen to my podcast Marketing School at all, you’ll hear Neil Patel and I mention this tool quite a few times. 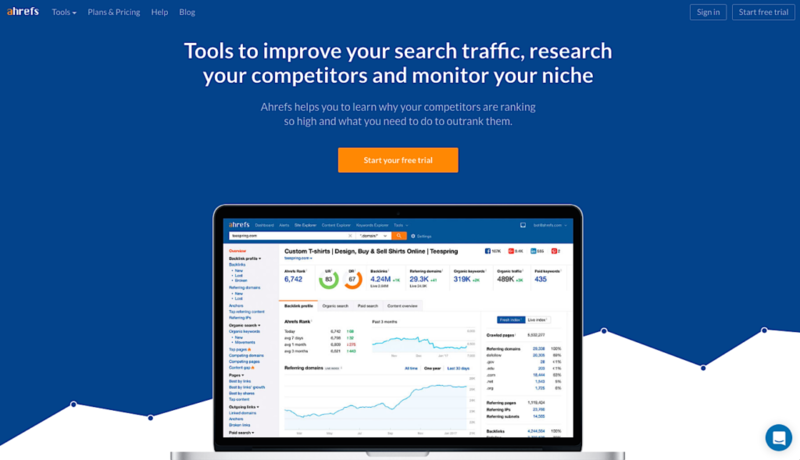 If you want access to it, you can just go to growtheverywhere.com/ahrefs (it’s an affiliate link). So I’m going walk you through some of the features that I really like, and you can use it for your own purposes. Take the website Lucky Gunner, for example. When I type in a domain name, I can already see that it’s ranking for 147,000 keywords. It has 2,600 or so referring domains and over 1.4 million backlinks. What I’m interested in looking at is the link velocity rate. How many new and lost referring domains and backlinks are coming in and going out? Just by clicking on the top pages for this domain in Ahrefs, I can see all the top keywords as well. “Cheap ammo,” “ammo for sale,” “ammo” and “ammunition for sale” are the top four keywords. What can I do to emulate this? I could export this data and do more analysis around it. What I like to do is look for keywords that rank in the top 5-30 positions, the low-hanging fruit, and try to push them to shoot up my traffic. If I can get a keyword, “Sig P320” for instance, from a number five position to a number one position, the click-through rate may double or triple. If the CTR rate is at 5-10% right now, that’s 2,500 clicks. If I can get it anywhere between 20-40%, that’s 20,000 clicks—a massive difference. You can also look at organic keyword movement and see how that’s fluctuating. You can track different keywords. 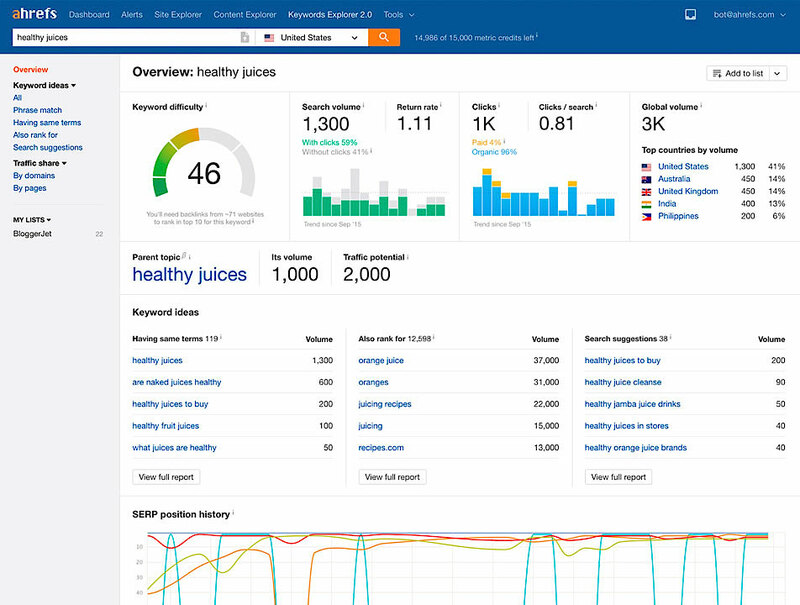 You can use the keyword explorer tool to see how many links you need to have in the top 10 for a certain keyword. You can see PPC keywords. You can even look at the content gap. What Is a Content Gap? Ahref lets you see what other sites rank for that your domain doesn’t rank for—this is called the content gap. It gives you high-priority content ideas that will let you get in front of audiences you didn’t even know you had. 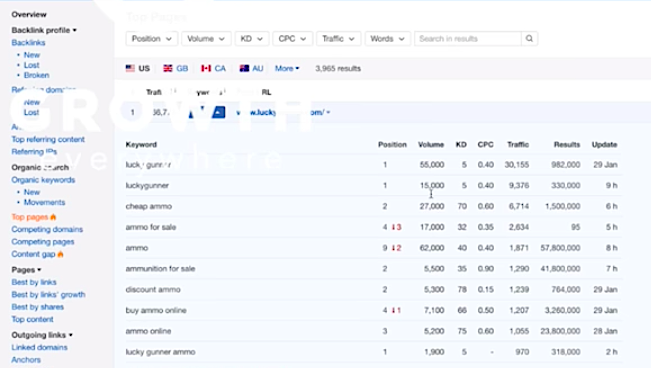 You can see that Lucky Gunner is not ranking for keywords like “AR-15,” for example. So maybe Lucky Gunner should be writing about AR-15s, right? There are a lot of different things that can be written about that are content opportunities. I also like the content explorer. I can type in a keyword and look at the top shared content. I want to look at pieces that are most linked to, and then see who’s linking to them. Those are the people I’m going to reach out to when I create an even better piece of content. 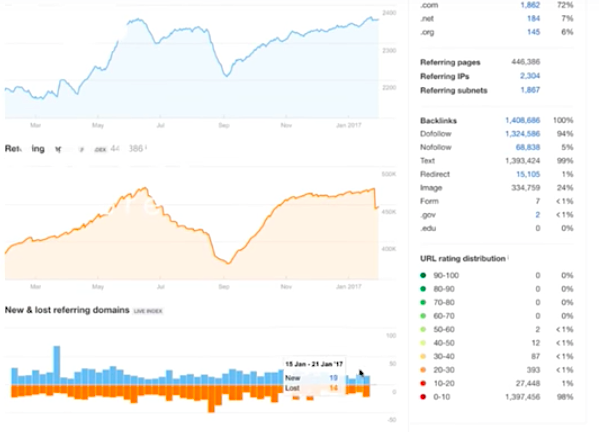 Ahrefs is good for everything from rank tracking to PPC competitive analysis. There’s an alerting feature that you can set that lets you look at new links that your competitors are getting. So I can look at new links coming to my site to build relationships and look at keyword movements for my site. There’s a lot that you can do with this tool. It really is the complete SEO tool that I’m looking for. If you’re interested, you can access Ahrefs here. This is an affiliate link which means that I will get a commission if you do actually purchase it, so thanks for your support! 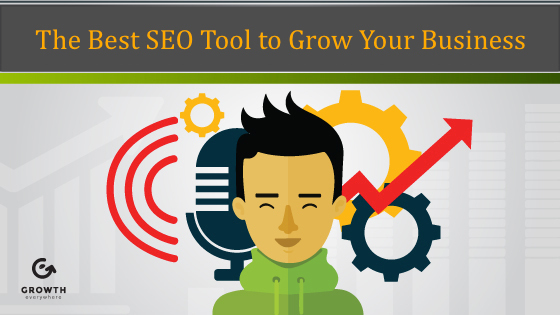 It truly is my most recommended SEO tool, so hopefully it is helpful to you.